Hope Everyone had a great Labor Day weekend. Ours was filled with celebrating the start of college football season. It was the first time I was lax on B watching TV. I figure I need to indoctrinate him early so he grows that passion for SEC football (specifically the Hogs, but we'll go broad at first!). Saturday we spent most of the day just chilling, watching football & watching B roll all over. He has completely mastered rolling from either back to tummy or tummy to back, and is very well aware that this is also a new mode of transportation. He still gets frustrated because he can't scoot or crawl, so I have a feeling it won't be long before that follows suite! Saturday evening we actually planned on watching the Hogs game through ESPN 360 at our friends Chris & Katie's house, but it ended up being blacked out :( That didn't mean we didn't get the kids dressed for the occasion! 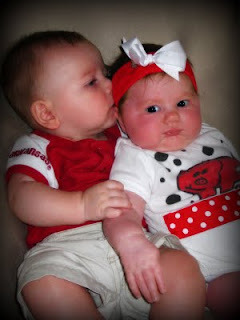 B dove right in for the full kiss, and tried to plant one on little Avery :) Aren't they the cutest! Sunday we went to church and then chilled in the afternoon. Our plan was to go to the new athletic facility with B and go swimming, but unfortunately he was fussy pants magoo all day, and so when he finally crashed, I decided to just stay home so he could rest. Today we were able to go to breakfast at Mimi's Cafe with some new friends of ours. B actually took a nap in public for the first time in a while, so we were able to enjoy the start of breakfast. Then he decided that he wanted to be the center of attention so we had to play baby handoff several times. This afternoon we hit up Chick-Fil-A for free Chicken sandwiches. Since we're cheapos, we just got the free sandwiches and came home to make our own french fries (thank you Ore Ida). Ofcourse, no Chick-Fil-A meal is complete without sweet tea, so I made a gallon of that and we ate to our hearts content. The meal was also complemented with my new find: Claussen pickles. OH MY GOODNESS are the the best! They taste just like the ones at the restaurants! If you haven't tried them, please go and get some TODAY. You will not regret it... I promise! And that, my friends, was our weekend.